With its beaches, forests, farms, and bucolic villages, Orcas Island – a rural island of 5,000 residents off the coast of northwest Washington State – has long drawn honeymooning, whale-watching, kayaking tourists and, increasingly, tech-exec millionaires building luxury homes. But as the “hidden Paradise” reputation of Orcas grew with vacationers and second home-owners, soaring land and home prices increasingly made living on the island challenging for the low- and modest-income full-time residents who originally called Orcas home and kept it running – teachers, health techs, waiters, builders, artists, and small business owners. In short, Orcas developed an affordable housing shortage. A lack of quality affordable housing for low-income families is not uncommon in rural America. In places like Orcas, affordable housing stock is threatened as well-to-do newcomers move into the region and decide to stay. In other rural communities, persistent poverty, a lack of quality housing, and limited access to affordable credit places home ownership out of reach for hardworking families (National Rural Housing Coalition). And it’s not just home ownership that’s problematic— the Housing Assistance Council reports that 45 percent of renters in rural areas spend more than 50 percent of their monthly income on housing. Orcas Island and other rural places have tackled this issue by developing community land trusts to make sure low-income families can rent or purchase affordable homes in their community – one of the critical Grow It goals in our Rural Family Economic Success Action Framework. Know It: What is a Community Land Trust? Since 1989, the OPAL (“Of People and Land”) Community Land Trust has offered a non-traditional way for working families in Orcas to buy a home and build assets while ensuring that housing remains affordable for the next buyer. Today, almost five percent of the island’s full-time households are homeowners in the OPAL Community Land Trust. But what exactly is a community land trust (CLT)? Because the CLT owns the land and sells or rents only the home, the CLT prevents the land component in the price of homeownership from rising due to market factors. A CLT requires people who buy homes to agree to limit the amount of profit they will make on the house’s sale, which assures that the house will remain affordable for the next owner of modest means. According to a 2011 National Community Land Trust Network survey, the average income for a CLT buyer is 65 percent of their community’s area median income. Not only does a CLT enable people to buy a home they could not otherwise afford, CLT homeowners often make a modest profit when selling their CLT house, which enables them to buy a market-rate house on the traditional market. And CLT residents appear to be less vulnerable to foreclosure – with a foreclosure rate that’s one eighth of the national average, according to the Urban Institute. An active program to buy land and increase the affordable housing stock. OPAL is one of an estimated 250 CLTs across the country, about one third serving rural communities. To find out if there’s a CLT in your region, check out the U.S. Directory of Community Land Trusts. Whether your community already has a community land trust or you’re starting from scratch, there are many ways to link a CLT with other RuFES action efforts. One of the easiest ways is to pair CLTs with complementary housing assistance programs, like the U.S. Department of Agriculture’s Section 502 Direct Loan Program, a federal home ownership program exclusively for low-income rural families and a critical lender for rural CLT homebuyers. Other housing programs include down-payment assistance programs and revolving loan funds that help rural residents finance their homes. 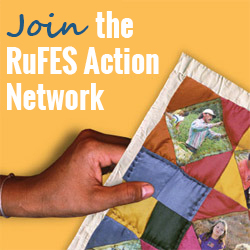 You can also quilt your affordable housing goals with other RuFES goals and create an action plan that will address them both! For example, if your goal is for families to have access to housing and reliable, affordable childcare (Earn It Goal 6), you might incorporate affordable child care facilities into new CLT developments. Or perhaps your goal is for low-income families to become leaders in their community (Grow It Goal 6)—you could quilt this with your housing goal and take action by working closely with CLT residents to design and organize community events. These are just two examples; there are countless other ways you can quilt Earn It, Keep It, Grow It goals together to increase your RuFES impact! Interested in starting a CLT in your region? You’ll need a core group of committed residents, a solid understanding of the funding available in your state, and guidance to set up the right policies. It also helps to find an existing local organization, such as a community action agency or Habitat for Humanity outpost, that’s willing to partner. The OPAL CLT began with just three volunteers who were committed to maintaining a community where all residents could live and thrive. Over a two-year period, the volunteers researched housing models, held public meetings, and finally established the non-profit community land trust. Five years after OPAL was founded, the first houses were built and tenants moved in. As the Orcas example illustrates, developing a CLT can take time. There’s no one-size-fits-all CLT model; every community has to tailor the model to meet its own residents’ needs and interests. Among the challenges can be community resistance, reluctant mortgage lenders unfamiliar with the CLT model and, recently, declining federal housing ownership funding that limits the resources CLTs have to buy land. The National Community Land Trust Network provides training, a technical handbook, advocacy and other resources including a responsive listserv at www.cltnetwork.org. Communitywealth.org offers a downloadable, step-by-step guidebook, Starting a Community Land Trust. OPAL Community Land Trust provides information at www.opalclt.org, or contact Lisa Byers at opalclt@opalclt.org.